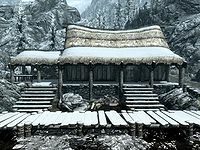 The Guardhouse is the Hjaalmarch barracks on the south side of Morthal. This barracks appears similar to other local houses. 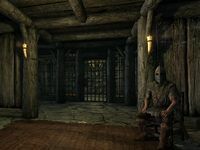 The interior is divided into two zones: the Guardhouse and Morthal Jail. There is a covered porch in front with a wooden bench along the wall to the left of the door. The porch continues around to the left of the building. In this area there are two food barrels, one with two unowned bottles of Nord mead on top, a target dummy, and a tanning rack. Benor often spends his time loafing here. The door is often novice locked, and you will incur a 5 gold bounty whether breaking in or out. There are two swamp fungal pods behind the building. This area is the barracks proper. Morthal guards are constantly coming and going from this area. There are a total of four single owned beds, two against the west wall and two against the east wall. There is a chest containing minor loot between each pair of beds. Opposite the door is in the middle of the south wall is a fireplace, with eight bottles of Nord mead and a bottle of wine on the mantlepieces. In front of the hearth is a kettle containing six pheasant breasts and a small round wooden table and two chairs. On the table are five bottles of Nord mead, a medium coin purse, five loose coins and an iron dagger. To the left of the fireplace is a barrel with three bottles of Nord mead on top and then, a flight of stairs leading down to Morthal jail. On the left of these is a food barrel with four more bottles of Nord mead on top. To the right of the fireplace is another food barrel, behind this is a copy of the Heavy Armor skill book 2920, MidYear, v6. Against the north wall is a long wooden table and bench. On the table are three bottles of alto wine, two bottles of wine, two bottles of Nord mead, several loaves of bread, two pine thrush eggs, a sweet roll and four salmon steaks on wooden plates. There is a basket of potatoes to the right and a barrel with two potions of minor stamina and one potion of minor healing on top. To the left of the table is a food barrel. Along the north wall and hanging above the table are four bunches of elves ears, three garlic braids, three bunches of frost mirriam. To the right of these are two hanging racks holding four rabbits and two pheasants. Downstairs is the jail, which consists of one large cage which is adept locked at the rear of the room, containing three bed rolls and a pile of food sacks. The rest of the room is partitioned with wooden walls either side of an opening. On the northern side of the wall on the left are the evidence chest and the prisoners belonging's chest next to each other. The rest of the room is used by the guards. Against the east wall are three straw bales and a chair, which the guard normally sits on. Along the south wall are several crates and food sacks. The west wall has several food barrels against it. These aren't marked as owned and therefore can be freely emptied. There is a barrel with three lockpicks and three bottles of Nord mead against the north wall. In the middle of the room is a long wooden table and chair. On the table is a bottle of wine, a bottle of alto wine and the key to Morthal jail. Some items found in Morthal Jail are not owned and can be taken without stealing. This page was last modified on 22 October 2018, at 20:28.